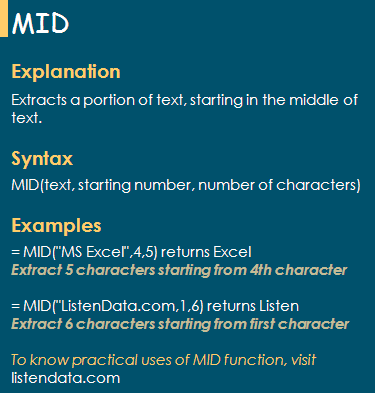 The MID function extracts a portion of text, starting in the middle of text. 1. To extract the first five characters from name. Follow the steps shown in the image below. 2. To extract five characters from name, starting from the third character. Logic : We need to extract characters till last character before space. The FIND Function finds the position of a portion of text in a text. In this case, it finds the position of a space in the name. Logic : We need to extract characters starting from first character after space. The FIND Function finds the position of a space in the name. 25 : I assumed maximum number of characters in a last name would be 25. The DATE Function returns the sequential serial number that represents a particular date. 1 Response to "Excel MID Function and Its Uses"